At Process Materials, we believe our future rests on our corporate values and company culture. Earning a global reputation for our commitment to quality and service, we have maintained these values as part of our daily operations since 1997. 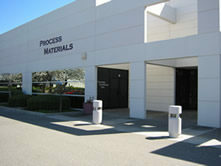 Process Materials is a leading manufacturer and supplier of consumable materials serving the thin film industry. Products include planar sputtering targets and cylindrical sputtering targets used in the production of flat panel displays, data storage devices, architectural glass, automotive glass, photovoltaic, optical media, decorative coating, AR, LCDs, hard coatings, etc. Target materials available include pure metals (including precious metals), alloys and compounds. We also carry a full line of evaporation materials. Fueled by a wealth of research, technology and innovation, PMI is located in Livermore, California, home to renowned science and technology centers, Lawrence Livermore National Laboratory and Sandia National Laboratory, and a center for manufacturing and international trade. At Process Materials, trust is as important as technical knowledge. Proud corporate sponsors of the Society of Vacuum Coaters (SVC) and the American Vacuum Society (AVS) and a member of the Association of Vacuum Equipment Manufacturers (AVEM). Copyright © 2018 Process Materials Inc. All Rights Reserved.